Serious fun with Five Line Jokers™ on Gaminator! The mystery game will be triggered when three stars will show up on three winning lines of the 5 Line Mystery ™ game. You’ll see six panels with their winnings before they are flipped face down and shuffled. 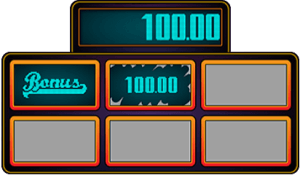 Pick the right panels until you get a blank to collect the winnings. 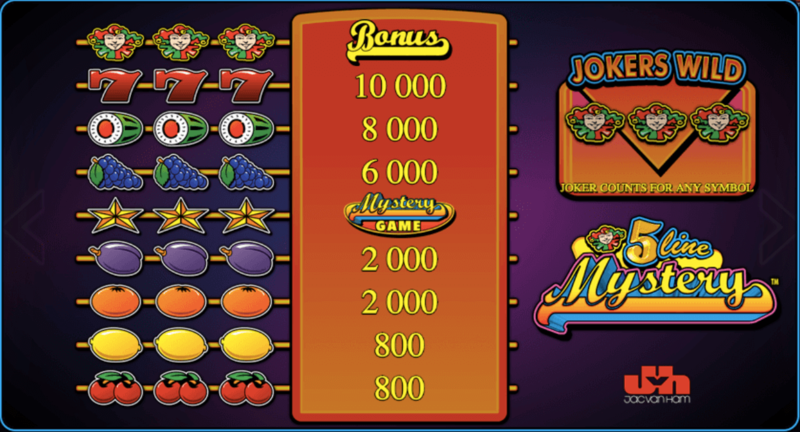 If you get three joker symbols on any winning line in 5 Line Mystery™, you will win the bonus that is shown in the upper right-hand corner of the game. That bonus will be re-calculated at each spin. Five Line Mystery™ is one of the most fun slots you can play on Gaminator, and make no mistake, also one of the most played in our online casino – those jackpots and the chance for bonus wins scaling up to 25 times your current stake are just too good to pass up! This slot machine has been received remarkably well by our players on mobile, and we are really happy to be able to bring it to you now our social gaming platform as well. Along up to five win lines and across three reels you get to spin for the win and see where your luck takes you. Payouts happen as soon as you manage to get three of the same symbols along any given win line – so keep spinning to see the biggest Jackpots you scored so far! 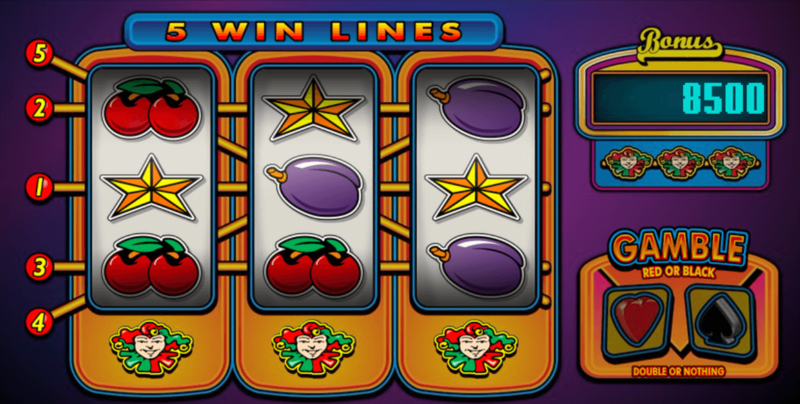 Contrary to old school Vegas slots, the win symbols are differently rated ever so slightly in Five Line Jokers™. Cherries are the lowest paying fruit symbols (GASP! ), followed by lemons, oranges and plums. Then come the grapes and water melons, with the latter especially showing a huge leap in payouts. Enjoy playing the best online slots in an up to date adaptation for modern browsers, platforms and devices. Enjoy the thrill of a night in Vegas with some of the most played slot machines and casino games in the world, and enjoy it all for free! A few quick spins on your favorite bandit during a break, or a real session at night, Gaminator has the right slot machine for you. Feel free to browse the dozens of machines and casino games at your leisure! 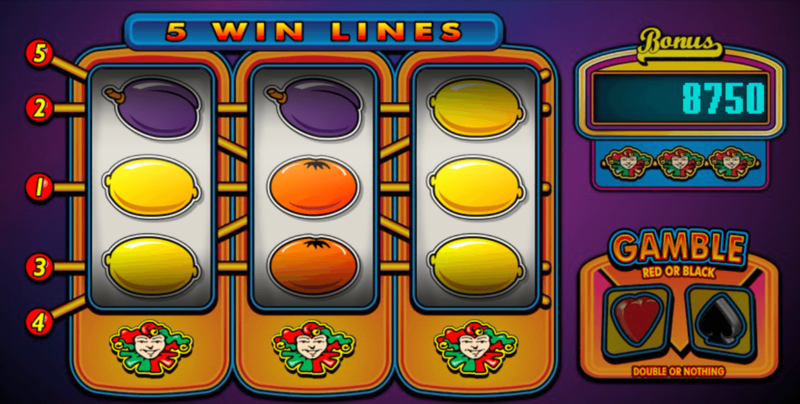 Five Line Mystery™ is the best slot machine to relax! 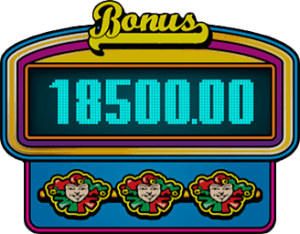 With such a high bonus available every round, mystery bonuses triggered left and right and the namesake Joker symbol acting as both the highest paying symbol across all reels (again, you want to line them up in threes everybody!) as well as the machine’s wild, substituting all other symbols needed along any given win line and our infamous gamble feature allowing you to increase your winnings even more (a true 50/50 bet by the way, so see how far you can push your luck yourself! 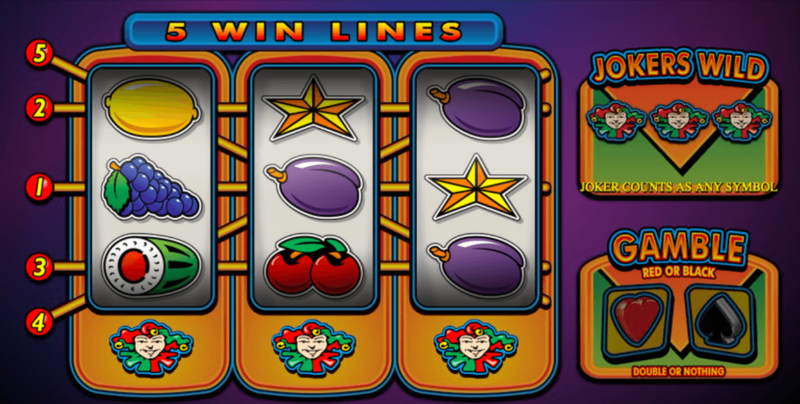 ), Five Line Jokers™ is truly one of the most versatile and entertaining online slots we know of. There are dozens of different ways to score a high jackpot, and we think exactly that is important to achieve a satisfying gameplay experience.